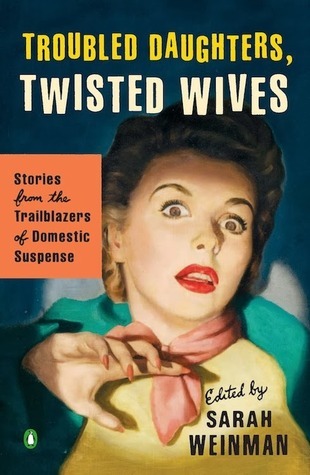 I discovered quite a great gem on my review shelf this summer, Troubled Daughter, Twisted Wives. I don't typically like short stories, but after reading this anthology edited by Sarah Weinman I'm starting to think that I was just reading the wrong type of short stories. My review shelf of print books has started to overflow, so I selected one to be my pool book. I thought a collection of short stories would be a good option. My only regret regarding this book is that it took me so long to pick it up. I love psychological thrillers and family drama so these 14 stories of domestic suspense are just up my alley. I typically read the contemporary authors, however, I loved reading these stories from the forerunners of the genre who influenced today's bestselling authors. And although these stories were published in the 1940s, 50s, 60s, and 70s, the themes explored still resonate today. It is this timeless quality that makes these stories so enjoyable. Each story is preceded by a brief introduction to the author and her writing. As I'm not familiar with these authors, I found the information interesting. The anthology contains 14 stories, Most are under 20 pages, but "The Stranger in the Car" is about 60 pages, making it the longest in the collection. I've tried to pick a favorite story of the collection but each one became a favorite as I read it. But if really pressed, I think I would say "A Nice Place to Stay" by Nedra Tyre. I liked the treatment of poverty in the story. Usually, in short stories, I feel like I don't connect with well with the characters - they don't feel real to me. In this collection, though, I felt the characters were well-developed. They felt like people that you would meet in real life. If you love family drama and suspense you should pick up this anthology, even if you think you don't like short stories. Oooh! I'll have to add this one to my TBR! I also struggle with connecting to characters in short stories, but this one sounds great! Sounds good and sounds like a great pool read. Glad you are enjoying it.